Cancer Treatments: Is a Ketogenic Diet Better? Mainstream cancer treatments are expensive, have some pretty debilitating long-term and short-term side effects and for some people and some cancers, not as effective as advertised. What if a ketogenic diet can help improve the outcome of mainstream treatment, and if so, how does it work? The effect that ketogenic diets have on cancer is rooted in how cells make energy to sustain themselves. Most normal cells can make energy by burning sugar or glucose in a pathway called glycolysis. Normally, glycolysis makes products which feed into mitochondria, tiny "powerhouses" in each cell. The main job of mitochondria is to make and regulate the production of ATP, the energy source that runs all living things. In order to stay alive, cells have to be able to make ATP and maintain the “free energy” of ATP at a specific level common to all cells. If there is too little ATP, a cell will become apoptotic (suicidal) and die. If there is too much ATP, cellular respiration gets interrupted in the mitochondria and this can also kill the cell. Normal, healthy cells have metabolic flexibility to make and regulate free energy levels through glycolysis or through mitochondrial pathways which require oxygen. Healthy cells are able to utilize all fuels, including glucose, oxygen, fatty acids, and ketones to make ATP and regulate energy flow through the cell. In contrast, most cancer cells have mitochondria which are broken in some way. They are unable to use mitochondrial energy pathways to burn oxygen dependent fuels such as fatty acids and ketones. To maintain free ATP at the necessary levels, they must rely on glycolysis even when oxygen is available. They do this by "fermenting" glucose into a product called lactate or lactic acid. This lack of flexibility means cancer cells are dependent upon and must increase the rate of glycolysis and lactate production to keep themselves alive. The lactate they produce is recycled into glucose for the glycolytic pathway in the tumor. In this circular way, cancer cells sustain themselves energetically without the oxygen needed for normal cellular respiration in mitochondria. Hence, the availability of glucose is a critical factor for cancer growth. Glucose is the main fuel cancer cells use to thrive, and the more glucose and insulin available in the bloodstream, the more glucose is available to allow cancer to sustain itself via glycolysis and fermentation. Excess glucose in the bloodstream comes from eating an abundance of carbohydrates. If, instead, a person with cancer adopts a ketogenic diet designed to treat tumors, the amount of carbohydrate eaten is reduced, which reduces blood glucose levels. This puts cancer cells under some serious metabolic stress. As glucose and insulin levels fall, cancer cells are faced with a fuel shortage. The important thing to understand is that because of their broken metabolism, cancer cells are vulnerable to any diet which sharply lowers blood sugar. It follows that prescribed cancer treatments should take advantage of this vulnerability. Dr. Otto Warburg, one of the twentieth century's leading biochemists, discovered this preference for glycolytic fermentation in cancer cells in the 1920s. His hypothesis that cancer cells preferred glucose (blood sugar) as a fuel is called the Warburg Hypothesis. Recent research and some new information on cancer cell metabolism and metabolic treatments has brought Dr. Warburg's hypothesis back into focus. "Emerging evidence indicates that impaired cellular energy metabolism is the defining characteristic of nearly all cancers regardless of cellular or tissue origin." And here's a recent independent paper highlighting that an increase in the uptake of glucose in nonmalignant human breast cells "activates known oncogenic pathways to induce malignant phenotype" (i.e. cancerous cells), which reinforces the idea that an increase in the cellular burning of sugar, a process called glycolysis, is a factor in the activation of cancer. In this paper titled "Targeting energy metabolism in brain cancer with calorically restricted ketogenic diets" the authors concluded that calorie restricted ketogenic diets were effective in stopping the growth of brain tumor in both animals and humans, and they seem to work by stopping the tumor from creating new arteries for supplying itself with blood, reducing inflammation, and restoring the normal cell death mechanisms. (Cancer cells are known to have the ability to avoid the normal mechanisms by which damaged cells die). And in this paper, Dr. Eugene Fine of the Albert Einstein College of Medicine hypothesizes that ketone bodies stop cancers by changing the availability of energy processes in cancer cells. A preliminary paper from Dr. Fine's team was published and the summary of results states that "Preliminary data demonstrate that an insulin-inhibiting diet is safe and feasible in selected patients with advanced cancer. The extent of ketosis, but not calorie deficit or weight loss, correlated with stable disease or partial remission." There's a podcast interview with Dr. Fine in which he discusses metabolic cancer treatments here. The main idea behind the use of a ketogenic diet as a cancer treatment is to deprive the cancer cells of the glucose and other fuels they need to survive, and provide support for the mitochondrial respiration processes in healthy tissues. When glucose or blood sugar is lowered via the diet, normal cells can switch to burning ketone bodies for fuel and survive quite nicely, while the cancer cells are starved of the glucose they need to grow. This is not to say that mainstream treatments shouldn't be included, but a ketogenic diet does give a person with cancer some control over the disease and treatment protocols. In fact, the research looking at the effects of ketosis on cancer cells shows there are some huge advantages in using a ketogenic diet (and fasting, the extreme version of ketosis) as a cancer treatment. First, the diet is non-toxic to the rest of the body, and actually supports the health and metabolism of normal cells, even through mainstream cancer treatments. It literally helps the patient weather the toxic effects of chemo and radiation more easily. See this case study on 10 people who fasted around their treatment (i.e, they were in nutritional ketosis) and what benefits they experienced. Secondly, it increases the effectiveness of mainstream cancer treatments. In other words, it makes tumor cells more sensitive to radiation and chemotherapy so that these treatments are more likely to be successful in killing cancer cells. Third, it seems to push cancer cells to into a genetic expression which is more like normal cells. See this mouse study on fasting and leukemia remission. The use of a ketogenic diet in conjunction with standard treatments as a cancer treatment is currently being explored in several trials funded by the National Cancer Institute, and more studies are being approved as interest in this "metabolic therapy" grows. And as of March 2016, a search of pubmed.gov using the words "ketogenic diet cancer" turns up over 120 papers discussing various research studies on this subject. Don't take my word for it, go and read the research, it's there for anyone who cares to look. 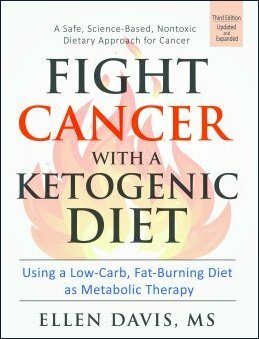 Because there is so little information available about using a ketogenic diet as a cancer treatment, I have written an book which explains in more detail how and why the ketogenic diet works for cancer treatment and provides details on how to implement the diet. The book is based on Dr. Thomas Seyfried's work and the work of Dr. Dominic D'Agostino. Dr. D'Agostino is a research scientist at the University of South Florida. His team specializes in the study of ketogenic diets and ketone esters in cancer treatments and mitochondrial disease. The diet prescription for those needing cancer treatment is basically the same as any ketogenic diet, in that it is a high fat, moderate protein, very low carb protocol. However, there are some differences. Calories and certain foods which are glucose and insulin stimulating are also restricted and certain target levels of ketones and blood sugar must be met. As Dr. Thomas Seyfried describes in his book "Cancer as a Metabolic Disease: On the Origin, Management, and Prevention of Cancer", there are target ranges of blood glucose levels and ketone levels that are optimal for stopping the growth of the cancer. Dr. Seyfried recommends implementing a restricted ketogenic diet and balancing blood sugar and ketone levels in a ratio he calls the glucose to ketone ratio, or the G/K index. He spoke about using a ketogenic diet to treat cancer at the 2012 Ancestral Health Symposium. Checking blood sugar and ketones levels requires using a blood sugar and blood ketone meter. There are many different brands of blood sugar meters, and just recently, several brands of blood ketone meters have been put on the market. The Precision Xtra Advanced Diabetes Management System is recommended due to it's accuracy. The meter can track both blood sugar and blood ketones with different strips. Be aware that the ketone strips are expensive. There's an comprehensive article here by Dr. Seyfried et al on how a ketogenic diet is implemented in cases of certain kinds of cancer. And Miria﻿m Kalamian, a nutritionist with a practice focused on supporting clients in the implementation of a ketogenic diet as cancer therapy and other metabolic diseases offers phone consultations. In addition, Beth Zupec-Kania, a dietitian with the Charlie Foundation, an organization with expertise in treating epilepsy with ketogenic diets, is also moving into helping people with cancer as well. Finally, I strongly recommend that your doctor or a knowledgeable nutritionist be involved as much as possible in the implementation of a ketogenic diet for cancer. Travis Christofferson, the author of Tripping Over the Truth, tells me that the first U.S. expansion of Care Oncology Clinics has recently opened in Rapid City, SD (August 2017). Care prescribes a patented cocktail of repurposed drugs as an adjunctive oncology treatment. He says the repurposing of drugs seems to be one of those things that should have been done a long time ago in oncology but there is no financial incentive driving it. (much like the ketogenic diet). Everyone agrees it's a great idea, both to bring down costs and improve outcomes, yet it was impossible, under the current system of phase 1, 2, 3, to FDA approval, to get it incorporated into standard of care. After about four years of treating patients they finally have data for the most aggressive form of primary brain cancer, glioblastoma WHO grade IV. The internal analysis conducted to date appears to be extremely encouraging with regards to overall survival, with patients experiencing minimal side effects. And the data is now in the process of being audited by independent bio-statisticians. Their website has a page on the results. For more information or to book an appointment with Care Oncology, call 1-844-859-6370. Dominic D'Agostino, Ph.D, a research scientist who specializes in cancer and mitochondrial disease research, has a blog here on which he discusses the research for using a ketogenic diet for cancer treatments. Dr. D'Agostino also has more information on his new blog Metabolic Optimization. This blog features podcast interviews with leading researchers such as Dr. Seyfried, Dr. Adrienne Scheck and other information from Dr. Dominic D'Agostino and Travis Christofferson, author of Tripping Over the Truth: The Return of the Metabolic Theory of Cancer Illuminates a New and Hopeful Path to a Cure. The Single Cause Single Cure organization has been formed to provide funding for metabolic therapy research. In addition, Dr. Georgia Ede has an excellent article here on treating cancer with diet. And here's an excellent talk by Dr. Dawn LeManne, an oncologist familiar with treating patients with ketogenic therapies. You can also visit my page which talks about what causes cancer, and why cancer research has been somewhat ineffective in eradicating cancer, or even reducing the rates of cancer in the USA. I'm a self-taught nutrition writer freely offering information about cancer treatments, nutrition and health with the hope of helping others feel better and live longer. No outside entity pays or influences me with respect to site content. If this information has helped you, consider donating to get the word out. Your donations to support these efforts are greatly appreciated, and gratefully accepted. Cancer patients aren't given many options in the mainstream medical standard of care. My hope is that the ketogenic diet will give back some control to those struggling with a cancer diagnosis. It will be a great day when there are ketogenic diet clinics in every hospital oncology department in the US, just like their are for pediatric epilepsy. At the very least, every person diagnosed with cancer should be advised to follow a low carbohydrate, high fat diet.